In a large bowl, stir together 10 cups ice water and 2 tablespoons coarse salt. Add chicken, submerging all pieces. Cover; let soak overnight in refrigerator. In another bowl, whisk together buttermilk, 1 tablespoon coarse salt, mustard, and 1/2 teaspoon each cayenne and black pepper. Transfer chicken to marinade, submerging all pieces. Cover; refrigerate at least 4 hours and up to overnight. Let chicken stand at room temperature 1 hour. In a shallow dish, whisk together flour, cornmeal, remaining 1 teaspoon each coarse salt and black pepper, and remaining 1/2 teaspoon cayenne. Heat a heavy pot filled halfway with oil over medium heat until a deep-fry thermometer reads 350 degrees. Remove chicken from marinade, a few pieces at a time (do not shake off excess); dredge in flour mixture. Transfer to a baking sheet. 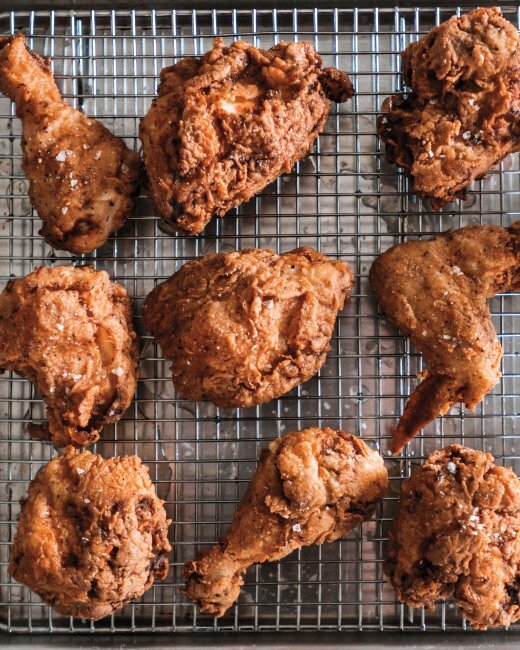 Fry chicken in batches until golden brown and a thermometer inserted into thickest part (avoiding bone) reads 160 degrees, 6 to 7 minutes for small pieces, 9 to 10 minutes for large. Adjust heat to maintain a temperature between 340 degrees and 350 degrees during cooking. Transfer to a wire rack set on a rimmed baking sheet; season with sea salt. Serve warm or at room temperature. This entry was posted in Food and tagged crispy, fried chicken, home made, marinade, recipe by Miss P. Bookmark the permalink.